Don’t mind me, I am just over here obsessing over the gorgeous color palette of these cute new pieces from the Talbots May collection. What I love even more though, is that they are size inclusive. This year, I’ve really focused on supporting brands who carry a range of sizes in the same styles across the board. I know many of you may not think of Talbots, but it is a great store for quality and great fitting pieces that are classic but on trend. Okay, let’s look at my favorites. When I first laid eyes on this gorgeous geo mixed print dress, I knew I had to have it. I immediately wanted to pack this dress up and take a trip to Greece or somewhere tropical. 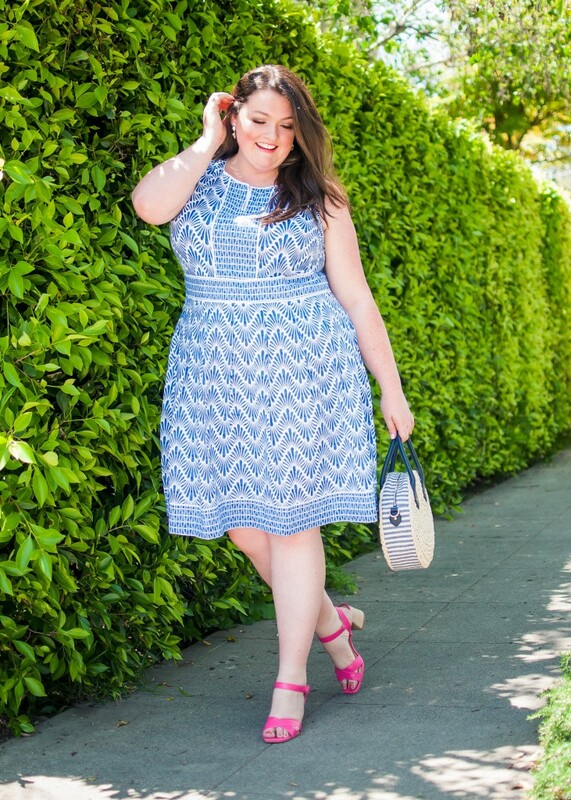 It is the perfect Spring/Summer look that I can wear to meetings, brunch or while on vacation. As if this dress wasn’t bright enough on it’s own, I fell in love with the Sienna Rope Heel in Tropical Punch. Talbot’s also has great accessories which made it easy to pull this whole look together with the Shell Drop Earrings and Crochet Straw Circle Crossbody Bag. Look 2: Stripe Lightweight Blazer A cool twist on a classic blazer, this striped lightweight jacket will be perfect for Spring and Summer. 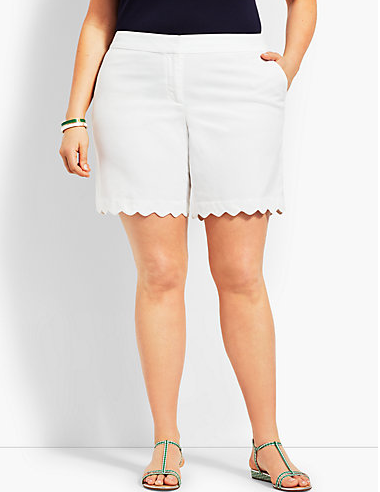 Pair it with some white jeans or my next pick, the white scallop shorts. Look 3: Scalloped Shorts (Exclusive to Plus) The white color is perfect to pair some of my favorite vibrant spring shades and pastels. Also, the shorts have a 7″ inseam which is the perfect length to give just enough coverage while being comfortable and still showing enough leg! 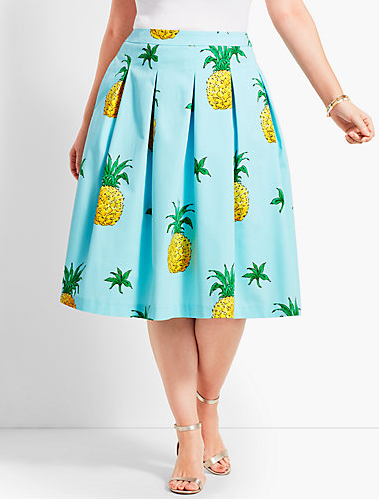 Look 4: Pineapple Print Pleated Skirt Nothing screams Summer more than pineapples. I love the fun, playful print on this skirt and would pair it with a white cami, tee or lightweight cardigan to finish off the look. 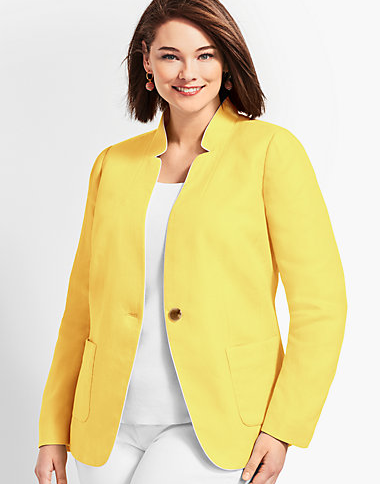 Look 5: Bright Lightweight Blazer in Yellow I am loving all things Yellow this season and this single button blazer is no exception. Pair it with matching pants or denim for a flawless look. 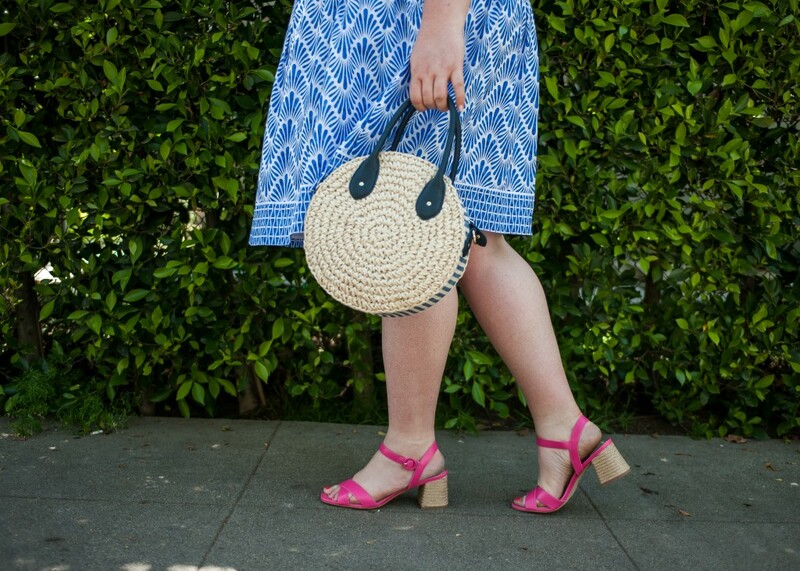 Don’t forget to check out some of my favorite must have accessories here too, like this Wicker Watermelon Purse! Right now they are offering 40 percent off dresses and some other items so definitely go check them out! 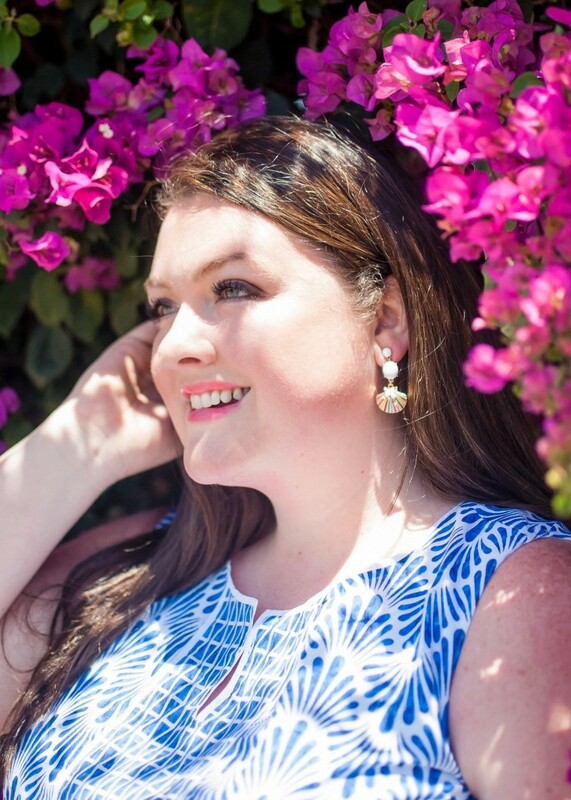 So, there you have it – some of my Spring Favorites from the Talbots plus size collection. I so need this dress. 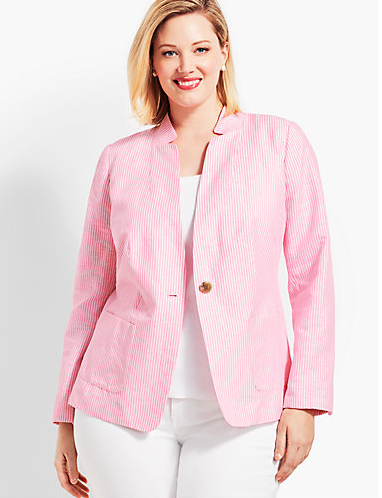 You are right I never really thought about Talbots but they’ve got some good stuff. Yes for sure! I love Talbots. 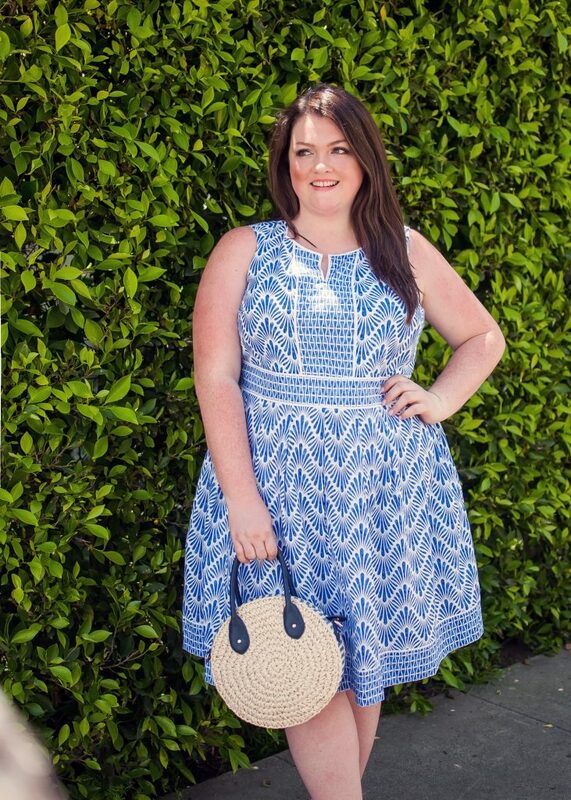 Love how you styled the blue dress Rachel!!! Pink is so girly and fun! hello…your outfit is so charming…cheers! The most adorable outfit! I love love love those pink shoes.